Long-distance running and endurance events can be challenging and rewarding — but they can also be dangerous. In the last week, two men have died while participating in separate races in Quebec. 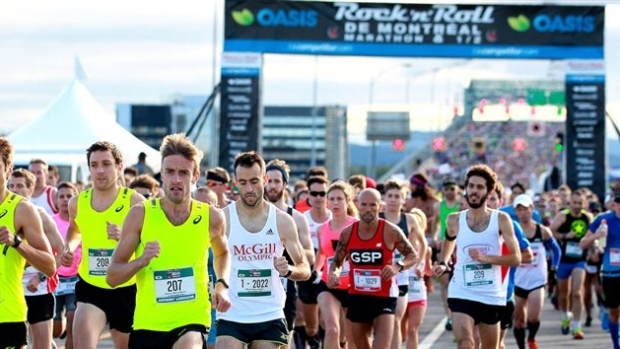 On Sunday, Maxime Pouliot Rochefort, a 30-year-old father from Saint-Augustin-de-Desmaures, Que., collapsed two kilometres from the finish line at the half marathon event in Quebec City. He was pronounced dead in hospital. His death came a week after a 42-year-old doctor from the Laurentians died after collapsing at the Ironman competition in Mont-Tremblant. The causes of death in those cases have not yet been confirmed, but these types of deaths are of great concern to Dr. Paul Poirier, a cardiologist at the Quebec Heart and Lung Institute who has looked at ways to screen for sudden cardiac death in sporting events. While the incidence of sudden deaths during marathons in particular is fairly low, Poirier has some tips for those thinking about participating in endurance events. Susan Campbell, host of Quebec AM, spoke to Poirier on Friday. The interview has been condensed and edited for length and clarity. What are the typical causes of death for people who die during these events? At 42 years old, the odds are [he probably had] coronary artery disease, maybe. If you look at the literature, above 40 is usually coronary artery disease, and below 40 is structural heart disease (which is congenital). Is there a part of an Ironman that will put more strain on a person's heart? It depends on the individual. If you're a swimmer, you'll probably have some difficulty doing the two other events. If you look at the literature, the sudden death rate during a half marathon is five times lower than during a marathon. So if you increase the length of the event, you increase the risk of sudden death. More people are doing triathlons for their own reasons, because they turned 50, and they want to do something … like climbing Kilimanjaro. They're not doing that for the right reasons. They're maybe doing it for their mental health, but not their physical health. They're not well-prepared. Are there warning signs people should heed? Athletes don't think those signs are important because they're used to [suffering]. No pain, no gain. So when they get short of breath, they get palpitations, they almost faint, their performance is decreasing during the season while it should be increasing, they say, "there must be something wrong, but I don't know what it is so I must continue." They don't get it. Or they have pain, it's chest pain, and they say, "You know what, I'm 40 years old. There's no way it's heart disease, so I won't consult my doctor." So should there be better education for participants? Better education and I will call it sports maturity. When you don't feel good, don't push the gas. Just brake a bit. What's the real difference of a few minutes? They push themselves at the last kilometre, over 42 kilometres, and they push themselves over the last five kilometres, and that's exactly where they drop dead. How would you tell people to seriously consider what their limitations are? Consult a specialist, a kinesiologist first because they're well-trained to train people, and if they want to push you and you have symptoms, consult your physician, just to be on the safe side. If you [run on] a treadmill, and you push as much as you can, it does not provide you with 100 per cent prevention of having a heart event, but it probably provides you the capacity to survive the event. The better shape you are, the better chance you will survive your event. It depends on where you're starting from. If you've been a sedentary person for years, if you walk 100 steps a day, this is considered moderate exercise. And if you do 30 minutes of moderate exercise five days a week, you will improve your heart health and your health in general. The more fit you are, then you can start cycling, running, whatever. But you need to walk before you run.